Home Politics Do People Kill People? According to the cliche, “guns don’t kill people, people kill people.” Is this a true statement? If it were true, we would expect that changing the amount of gun possession would have no effect on the total number of murders. Indeed, this was exactly the case in Australia. How can this possibly be? Quite simply, if murders are driven by people, then taking away guns will just drive persons intent on murder to either acquire guns illegally to use in the deed or to use other methods to perform those murders. In Australia, murder by other causes increased after the number of guns decreased. In fact, total murders actually went up, not down, in the years immediately following the ban. Yet one case study is insufficient. We need more evidence. Let’s look at the top 50 countries by total gun ownership and compare their murder rates. If the cliche holds true, then we would expect to find no correlation between gun ownership and murder rates. Indeed, there is no correlation at all. If anything, this data, cherry-picked by only selecting high ownership countries, shows a very slight bias in favor of the argument that gun ownership results in fewer murders. In order to rule that possibility out, we really need to examine the complete list of countries. 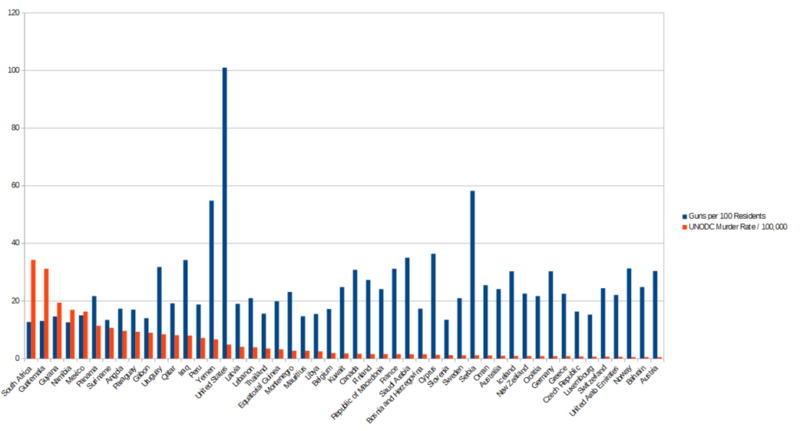 Unfortunately, the graph is way, way to large because there are so many countries. Yet it’s still clear that there is no significant correlation between gun ownership and murder rates. If there is any trend at all, it is that countries with the highest levels of gun ownership are more likely to be on the lower end of murder rates. Thus having examined the entire world, we find more evidence that gun ownership has no meaningful effect on the number of murders. There are many factors that go into the murder rate, which is why Europe and Australia have such low rates and the United States is relatively high. Geography, population density, demographics, and cultural influences are all highly applicable factors. Gun ownership just isn’t one of the primary factors. This is a highly emotionally charged issue. Many of those who seek to control guns do so out of fear and desperation. Yet the facts and evidence indicate that these control efforts will do little to nothing. They are not a solution to any macro problems. Thus any calls to implement them are nothing more than false hope. This is the reason some people are unwilling to try any form of gun control: they know that gun regulations are unlikely to solve the problem. The conversations should focus on educating people on gun regulation’s lack of efficacy so efforts are directed at finding solutions that do work. It is possible that some local policies could be effective in solving local murder problems, but this is out-of-scope for this macro analysis. The evidence indicates that aggregate local policies will have no effect on the macro rates even if a small number of local policies turn out to be somewhat effective. As such, this does not preclude effective local gun policies, but it does indicate that they should be limited in scope, monitored for efficacy, and expected not to succeed. Additionally, raising the gun purchase age from 18 to 21 and running consistent electronic background checks may have a noticeable effect reducing mass shootings without affecting the macro murder rate. This is the case because mass shootings are quite rare and thus their incidence isn’t enough to meaningfully move the macro numbers. Or perhaps get worse if the cliche “If you take away guns from the good guys, only the bad guy will have them” is true. While there is some evidence that this is true, I will not be making that case. Of course gun murders correlate to gun possession. That’s tautological. This is why we must look to murders by all causes. This is important because deaths by guns are not more special than deaths by other causes. Dead is dead. For those without a background in mathematics and statistics, if there is no correlation between two variables, then changing one variable will have no effect on the other variable. So the amount of gun ownership (variable #1) could change and the murder rate (variable #2) could change and we would correctly conclude that they had nothing to do with one another. So if we reduced guns, like Australia did, and the murder rate went up, we would conclude that the murder rate would have gone up even without the ban. Similarly, if it had gone down we would conclude that the rate would have gone down even without the ban. Except, perhaps, for mass shootings. There is some evidence that banning guns reduces the number of mass shootings. It does not, however, noticeably decrease the total number of lives lost. There is also some evidence that arming teachers also reduces the number of mass shootings, so this is not a cut-and-dry single-solution issue.